Gullfoss waterfall was our last stop on the Golden Circle Tour in late October 2016. I had previously visited the falls in October 2009. It was much colder and icier during that visit.The sunny and showery weather during my recent visit to Gullfoss waterfall made for better photos. 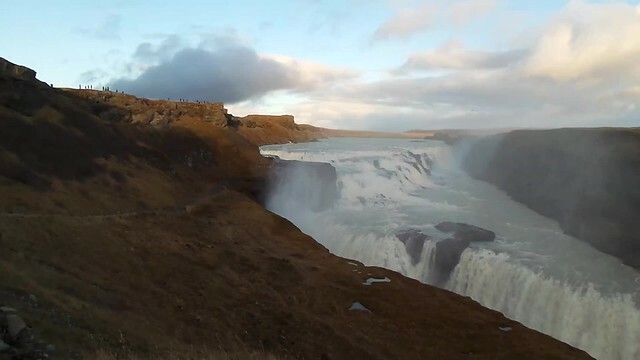 We visited Gullfoss as dusk was approaching. There were some great views towards to snow capped mountains. The cafe at Gullfoss Visitor Centre had a candle map of Iceland. There was a lovely photo of Icelandic horses on another wall of the cafe. There was some very tempting cake for sale in the cafe. But I as we’d be having dinner at the Hotel Ranga, I managed to resist. This entry was posted in Iceland on May 4, 2017 by Karen Bryan.